For the past few years, pizza chain Domino's has been attempting to revive its image by admitting that the pizza it was selling was less than delicious. The ads show the pizza chain creating new products, revising their crust and sauce, and responding to internet criticism – namely that their pizza tastes like "cardboard." The commercials have seen mixed to fair reviews, with most people acknowledging that it takes guts for a company to denounce the quality of it's product and try to make it better. In this clip Domino's sends free pizza to a customer who complained that he'd previously ordered and received his pizza in unsatisfactory condition. Is this marketing strategy genius or just plain dumb? Microsoft seems to think the former - I stumbled upon (using the browser extensions StumbleUpon - you should check it out!) 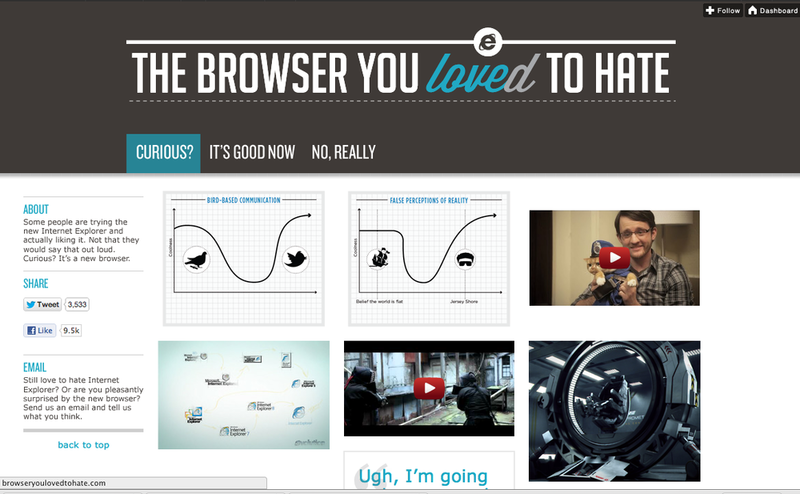 a tumblog called "The Browser You Loved To Hate." The description on the page says that "Some people are trying the new Internet Explorer and actually liking it," and is replete with tweet testimonials of people reluctantly admitting that they like the latest version of the browser. What is really interesting is that there is no mention of Microsoft on the site at all. A promotional video that accompanies the site says that "previous versions of Internet Explorer were only good for downloading another browser." What do you guys think? Is this a new trend, or merely a blip on the radar? As we've discussed in the past, Gen Y is very adept in figuring out marketing schemes – these campaigns rely on a wink, wink, nudge nudge mentality. Would a credit union ever attempt an ad campaign like this (successfully)? Give us your thoughts in the comment section!